Mary was promoted to heaven on December 8, 2013 surrounded by her family after a long, courageous battle with lung cancer. Mary was born in Woodbury, NJ. She is survived by her loving parents, Thomas A. and Mary (Malloy) Deeney of Melbourne, FL (formerly of Audubon, NJ). She is the cherished sister of Anne Deeney, Aileen Foster, Thomas (Lorraine) Deeney, Patrick (Linda) Deeney and Barbara Hanson. She is the devoted aunt to Mary Deeney, John and Adam Foster, Nicole (Jason) Bintliff, Jackie (Jonathan) Chain, Brian and Patricia Deeney, Kyle and Kaitlyn Hanson. Mary belonged to a large extended family and is survived by many cousins and relatives with South Philadelphia origins. She was the former wife of Michael Coyle and loving member of the Coyle family. Mary was a 1973 graduate of Audubon High School and had a close bond with a group of her high school friends for over 45 years. The girls shared a raucous weekend in New Orleans where Mary was working just prior to her diagnosis. Mary played soprano horn with the Audubon All Girl Drum and Bugle Corps ("Bon Bons") and attended a Bon Bon Reunion in Wildwood this summer. Mary started working at Steak and Brew in Cherry Hill, NJ in 1974 forging many lifelong friendships. Mary is well remembered by many for her 12 years behind the bar at McGlone's in Oaklyn. Mary then worked at the Admirals Club at the Philadelphia Airport. For the past 16 years, Mary was an employee of Marriott Hotels progressing through many positions to Bench Manager filling in at many locations around the country. Mary loved to travel both with family, good friends and through work. Family was a priority to Mary and she loved attending events and gatherings with her aunts, uncles, cousins and extended family. Mary was a member and former officer of the Ladies Auxiliary of American Legion Post 84 in Oaklyn, NJ. She was involved with the Juvenile Diabetes Research Foundation for over 20 years. 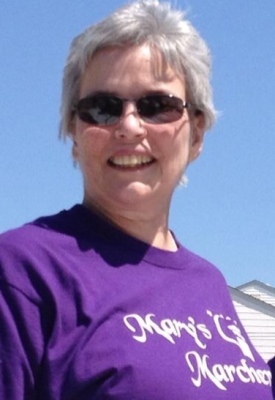 She had a Relay For Life Team, Mary's Marchers, formed by her niece Kate at Haddon Heights High School raising funds for the American Cancer Society . Mary was an entertainer at heart and surrounded herself with people, music and dance. Mary often hosted an after hours club at her various homes, most famously at the "Lafayette Lounge." While you often waited for Mary to arrive, she lit up the room once she was there. A sincere thank you to the Abramson Cancer Center at the University of Pennsylvania, both Penn Presbyterian and Pearlman Center, for their dedicated care and support of Mary over the past three years.